If your browser doesn’t redirect you to the new location, please visit The FSHuntress at its new location: www.fieldandstream.com/blogs/fshuntress. Kim Hiss, an associate editor at Field & Stream, has hunted ducks, antelope, turkeys, and deer throughout the country, enjoying a number of women's hunts along the way. She lives in Dobbs Ferry, New York. Click here to email Kim. When I told Sarah M. she'd won this week's Gear Giveaway, she promptly replied with an update on her 2008/09 season, during which she got her first deer and her first duck! While she's excited about deer hunting, she said she's hooked on duck hunting, and hopes there are other waterfowlers on the blog (shout out to NorCal Cazadora!). 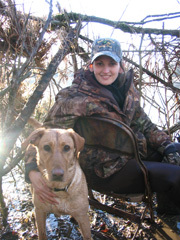 Congrats to Sarah (and her hunting partner Taylor with her in the photo) on a milestone season! -K.H. The Giveaway is back after a holiday break, and our first winner of 2009 is reader "Sarah M.!" She's relatively new to the blog, but from her comments on her black Lab and Shih Tzu to her four-in-one New Year's resolution plan, she's contributed a lot to almost all our recent conversations. Sarah will be receiving the very cool combo prize of broadheads from Muzzy and scents from Tink's. So congrats to Sarah, and a big thank you to Muzzy and Tink's. And I look forward to naming another gear winner next week! -K.H. After a break in our Q&A series, I'm happy to start back up with 2008 F&S Heroes of Conservation award winner Sandra Millan-Tripp. A marine biologist, English as a second language teacher and angler, Millan-Tripp lives in Old Lyme, Conn., with her husband (and joint award recipient) Jim, and two "curious and energetic" boys Morey, age 10, and Grey, age 9. Sandra and her husband began their award-winning conservation project after noticing a decline in the local herring runs. They decided to turn their old family mill into a facility to rear herring and salmon fry and formed the Tributary Mill Conservancy in 2004. Their conservancy became a nonprofit in 2007 with the goal of spreading their method of fry rearing across New England. Sandra has always loved the water, and learned to fish through her husband. She now enjoys going out with her family, catching small mouth bass and occasionally night fishing for stripper and blue fish. I asked Sandra about her early research into marine mammals in Colombia (because, let's face it, that's just cool! ), and the Connecticut conservation work that followed. Thanks to Sandra for a great interview. -K.H. FSHUNTRESS: What made you first want to research dolphins and manatees? SANDRA MILLAN-TRIPP: I grew up in Colombia, South America, and have always been in love with nature. The areas of conservation and medicine were the right paths to follow. I became a veterinarian and had a great opportunity to be involved with wildlife medicine. For all the beauty of nature, marine mammals have a special place in my heart. Colombia has so many species to enjoy: two of the three species of manatees that exist in the world (the Antillean and Amazonian manatees), Pink dolphins in the Amazonas region, humpback whales on the Pacific side, and bottlenose dolphins and Sotalias in the Atlantic Ocean among others. Although the conservation efforts are like a grain of sand when compared with the necessity of restoring species that are on the brink of extinction -- as Manatees are -- the efforts are worth while, not only for the conservation of a beautiful animal but for the ecological role that a specific species plays. FS: What was the hardest part of your herring and salmon project? SMT: Finding funds was crucial. My husband Jim and I knew that we had an ecological treasure in the backyard. We witnessed the alewife spawning migration so many springs, and suddenly the population became depleted. We were eager to act and be involved in the alewife restoration -- later on with the salmon restoration -- but funds were limited. We chugged along for several years with our own resources, small steps, and little by little what began as the desire to help had turned into a non-profit organization. FS: What was the most rewarding part? SMT: Stocking thousands of Atlantic Salmon fry into the Eight Mile and Salmon Rivers (both tributaries of the Connecticut River), and finding out that the survival rate is quite promising. Being able to hatch a few hundred Alewife larvae -- acquiring knowledge about this fish is quite important to developing a system that could aid in the return of more larvae to the river. Producing the documentary about the Atlantic Salmon rearing activities, which was a great team effort produced with the goal of providing an educational tool for the school systems. FS: You and Jim are the first married couple to win the Heroes of Conservation award. What does it mean to have a husband as passionate about habitat preservation as you are, and with whom you can share your outdoors pursuits? SMT: Being nominated as one of the 2008 Heroes of Conservation, and the first married couple ever nominated came to our door unexpectedly. It is a beautiful feeling, almost like a fairytale. Jim is my other half! We compliment each other in such a way that our dreams can become reality. I am blessed with a husband that is not only the father of my children but a friend who I can trust, share and live life with. I have always believed that the family is the nucleus of society as well as conservation. So, having a husband as passionate about habitat preservation as I am means that we will be able to pass along to our children the heart and desire to be part of conservation as well, and together we can share memorable outdoor pursuits. FS: Do your children fish as well? SMT: Morey and Grey love fishing! We take the canoe in the pond and they love catching small mouth bass, pickerel, and catfish among others -- catch and release. Sometimes we go crabbing. They are looking forward to going fishing for strippers next summer. FS: How important do you think it is for everyday American sportsmen to do whatever they can, big or small, for the country's wildlife habitat? SMT: Just like Theodore Rooselvet once said, “Do what you can, with what you have, where you are." The ripple effect of our actions is enormously valuable; many small achievements can turn into a larger achievement. Seeding the hearts of future generations with the desire to conserve, preserve, or improve the natural resources we enjoy today is a must. We as sportsmen (and women) enjoying the beauty and bounty of this planet can set an example of conservation through our actions, by showing respect and appreciation. These actions can be as simple as following the established rules related to keeping sizes, space and seasons for fishing and hunting, or becoming involved with conservation organizations. One person cannot do it alone; it takes all of us. I haven't picked one yet. And considering we're more than a few days into 2009, the pressure is on. I think the problem is this New Year feels weightier than most because my family lost two wonderful people in the closing weeks of 2008. One was an actor, the other a retired X-Ray technician, and both lived rich, full, adventuresome lives. It can be hard not to contemplate your own mortality following the loss of a loved one. In the days after a funeral, I'll find myself considering the state of my own life, and more often than not, resolving to live it more fully, more honestly, and more closely with friends and family. Considering such thoughts, my recent New Year's resolutions (stop biting my nails in 2007 and be a more responsible recycler in 2008) sound ridiculous. Instead I feel a good deal of pressure to come up with a core, meaningful resolution -- one that will honor my lost loved ones and contribute to the life I share with others. I hope I come up with something good soon. In the meantime, I wonder how seriously the rest of the blog takes the clean-slate opportunity that each New Year brings. Do you tend to be a resolution maker (and keeper), or do you consider self-improvement a year-round pursuit, regardless of the date? I'm willing to bet more than one of us chose a resolution having to do with the field -- whether it's related to performance or just spending more time outside. Anything along those lines sounds good to me. One of my family's recent losses sparked conversations about long gone bird dogs and afternoon fishing trips. It's really something that -- during a funeral commemorating 9 decades on earth -- those field memories in particular bring so many smiles. It certainly speaks well of any resolution having to do with heading outside. -K. H.
Here's another gem from the F&S archives to wish you and your families a healthy and happy New Year. Hopefully 2009 will bring each of us many rewarding hours, "In the Cathedral of Nature." Also, a note for New Year's Day: Our own Jan Favors (known to us as Jan) went on an NRA Women On Target safari last August, and she wrote to let me know that her hunt for a Mountain Reedbuck will be featured on the Outdoor Channel January 1 at 9:30 p.m. I can post some of Jan's pictures and a few more details on her hunt next week (she called it the "most fun" of her four trips to Africa), but just wanted to make sure that those of you who get the channel know to keep an eye out for Jan! -K.H. Blog reader Judy Black is always very generous with her tales, and she recently sent a great one about a "first timer" that fits in with our feel-good holiday programming. Judy started out by saying that her sons, now 27 and 29, grew up watching her and her husband Scott hunt. While her youngest didn't take to the sport, her oldest, Brian, "has the raging fire like his mother for hunting." Brian harvested a spike horn in 1996 and a small 7 two years later. It was then that he decided he would plant food plots and let the small ones go -- a decision for which Judy says she admired her son. After going on to practice deer management, Brian killed an "awesome" 10 point opening morning 2006, and another 10 point opening day of the following year. He still practices QDMA on his family's 150 acres. I'll let Judy continue the story about the next generation of her family's hunters from there. -K.H. In 2001 Scott and I purchased almost 200 acres that was once part of his grandparents' farm. Situated on the land was a 1973 mobile home, and the ink wasn't even dry on the paperwork, when we started calling it camp. Scott's brother Jim owns 300 acres adjacent to our property. It has some of the best hunting and farm land in the area and Jim is an avid hunter as well. By fall the food plots were planted and the blinds in place. Jim has a son Jason, now 21, and he too loves to hunt. He spends countless hours walking or driving their property taking note of the bucks and by October I swear he has them named. If you tell him you saw an 8 point buck, you best know if it had a broken G2 or real white horns. It is not very often that a buck shows up that Jason hasn't already seen. Jason's youngest sister Sadie has sat with her dad and Jason many times for many years. She has never hunted and is now 16 and has the normal interests of a 16 year old young lady. But this year Jason "begged" her to get up opening morning to hunt in his stand with him. She went and they didn't see anything that morning. Sadie went again for the afternoon hunt and this is where the real story starts. Around 4:30 Jason told her there was a buck coming out. He didn't know how big it was, just that it was a buck and he had promised her that he would let her shoot "something." Sadie would later tell me that he was "bouncing off the walls" telling her to take the gun and shoot. She was totally unprepared and took a little longer than Jason was comfortable with getting ready to shoot. He was "having a fit" as the buck walked off into the woods....Sadie was like, "what the heck"!!! The buck turned and came back out to the edge of the field and now Sadie was ready. She took aim and fired the shot. Both of them watched as the buck disappeared into the woods. Both Jason and Sadie knew it was a good hit so they started burning up the cell phone lines. A call to mom brought a "yeah right" and then to Uncle Scott who couldn't understand what she was saying. Back at camp I was patiently waiting for them to bring her trophy as Scott told me Sadie had shot a 10. I was so dang excited for her and could not wait to see it. They backed the pickup up to the porch of camp where the light was good and we could all see. I was barely out the door when the passenger door flew open and I was greeted by the biggest smile you can imagine. I hugged Sadie and told her over and over how very proud I was of her. She chatted a mile a minute recounting the story of Jason "bouncing off the walls" and then her shot. She just kept pointing from herself to the buck saying "I did this....I got a 10 point buck!" Once again I told her how proud I was and Sadie's reply was "I just kept thinking, who, who, who will be proud and I said..Judy will. She will be so proud of me because she hunts and knows." I was about in tears as it made me realize that all those years of watching all of us hunt and celebrate the harvest, this young lady got it. It isn't just the hunt, it is the camaraderie, the thrill, the sharing of the stories. It is about family and friends doing what they love to do and then taking it all back to "camp" and sharing. Sadie now had her own story to share and she will have that memory for the rest of her life. My sister has always told me that "I never look happier than when I have a dead animal in the picture with me." Well, it is not only my harvests that make me smile. We took pictures of Sadie that night and I asked that one be taken with her and I. She brought the pictures over to me the following night and I have to say there was no wiping that smile off her face the night she killed that buck, she was one proud, happy young lady. But the picture of Sadie and I together shows that I was just as happy and proud as she was. If I don't harvest this season it will be just fine with me. It meant more to me to have Sadie get her first deer than if I shot a 12 point myself. I remember my first fish and I remember my first deer. I too remember my kids first deer. Now I can say that I remember Sadie's first buck, an awesome 10 point. What a treasured memory. -J.B. This cover comes from deep within the Field & Stream archives -- pretty great, isn't it? I thought the illustration was a perfect way to say Happy Holidays from FSHuntress! I hope you and your families enjoy a marvelous holiday season! -K.H. I thought we'd start some feel-good holiday programming with a tale of a dog owner who saved his retriever's life -- then the retriever saved a life right back. According to this North Carolina News & Observer story, state resident Peter Maynard was living in Massachusetts in 2006, when his retriever, Clyde, started sneezing blood. The vet couldn't figure out what was wrong, and Maynard stayed home with his ailing dog while relatives brought him food. When he later moved to North Carolina, doctors there found a tumor in Clyde's nose and gave him a few months to live. But Maynard was willing to do whatever it took to help his dog, and had doctors administer a round of radiation. Clyde responded well to the treatment and seemed to pull through. Fast forward to last October, when Maynard's partner Gloria Mitchell was home alone and asleep with a cold when the recovered Clyde jumped into bed to wake her up. Despite her groggy objections, the dog forced her out of bed, at which point she realized she wasn't groggy from a cold, but from smoke coming from a fire under the house. Since rescuing Mitchell, Clyde has again begun sneezing blood and is undergoing another round of radiation. Maynard says he's spent $10,000 on treatments for Clyde, but he feels the sacrifice is more than worth it. I don't own a dog (unfortunately! ), and I don't have $10,000 to spend on one if I did. But I can certainly understand the motivation to do anything in your power to aid an ailing pet -- I'm sure many of us do. -K.H. Katie Hendrickson! Known to us as "Katie," she is a long-time blog reader, and says she got her first bow harvest with her Gear Giveaway prize from last year -- a FatBoy hunting cushion from Hunt Comfort. As a hunter who also loves to fish, Katie will be getting a fantastic tackle bag from Zack Tack -- the original Camo Soft Tackle Bag and Backpack Tackle Box. So congrats to Katie (and good luck to her on her finals! ), and a big thank you to Zack Tack. Just a heads up that the Gear Giveaway will be taking a short holiday break, but I look forward to finding more good homes for great gear in January! -K.H. Regardless of how much I'd love to post nonstop field reports on well-earned harvests at this time of year, we should really take a break now and then to discuss the world beyond the woods. President-elect Obama's selection of U.S. Senator Ken Salazar of Colorado as his Secretary of the Interior seems like one of those times. Salazar is a controversial choice. According to this New York Times story, his record drew, "mixed reviews from environmental groups on Wednesday, but cautious praise from energy and mining interests." On one side are executives such as Marc Smith of the Independent Petroleum Association of Mountain States, who said in a statement, “We are pleased that the president-elect has chosen someone who understands that there is a direct connection between federal lands and access to affordable, clean natural gas." Wearing his usual ten-gallon hat during Wednesday's news conference, Salazar said that his job would include not just the development of green energy like wind, the Times story said, but also, "the continued domestic development of coal, oil and natural gas, [and] fossil fuels that generate heat-trapping gases when they are burned." It's a fine line between energy development and habitat protection, and I can only hope the most talented, experienced, well-informed and forward-thinking candidate has been chosen to walk it. -K.H. Enter your email address to get FS Huntress in your inbox every day!